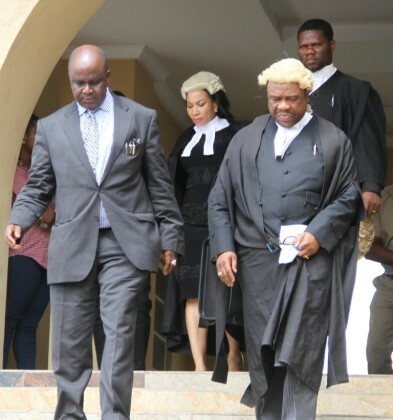 Wilson Uwujaren, Abuja: The trial of Ricky Tarfa, a Senior Advocate of Nigeria, SAN, continued on Friday, January 13, 2016 before Justice A.A. Akintoye of the Lagos State High Court Igbosere, Lagos, with a prosecution witness, Danladi Daniel, an operative of the EFCC, revealing how the defendant had declined to sign the asset declaration form administered on him. Daniel, who is the third prosecution witness, PW3, told the court that he first gave the defendant a telephone forensic form to fill out, following his arrest in February, 2016. The witness further told the court that he later took the form for forensic analysis after the defendant had filled it out. Led in evidence by the prosecution counsel, Rotimi Oyedepo, Daniel added: “My team leader, Mr. Ahmed Gali, asked me to administer an asset declaration form on the defendant, but he declined to fill it. While testifying further, Daniel told the court that the defendant was duly informed about the need to fill the asset declaration form and that it had nothing to do with his alleged obstruction of justice that he is being prosecuted for, among other charges. He also stated that the interview was recorded and burnt on a compact disc, CD. Both the CD and certified copy of the interview were tendered and admitted in evidence by the court. Tarfa, who was re-arraigned on November 16, 2016, is being prosecuted on an amended 26-count charge for refusal to fill asset declaration forms, while also offering false information to an officer of the EFCC and offering gratification to a public official. One of the counts reads: ‘‘That you, Rickey Tarfa, SAN, on the 27th day of June, 2012 in Lagos within the jurisdiction of this Honourable Court, intentionally gave the sum of N1, 500, 000. 00 (One Million, Five Hundred Thousand Naira only) to Hon. Justice Hyeladzira Ajiya of the Federal High Court directly from your Zenith Bank Account No. 1002926967, in order that the said Judge acts in the exercise of his official duties contrary to section 64 (1) of the Criminal Law of Lagos State, No.11, 2011”. The case has been adjourned to January 27, 2017 for continuation of trial.